Katie is not only my trainer but she has since become a close friend of mine and having her in my life has been nothing short of life-changing. Katie is my fave, I cannot explain it, from teaching me how to cook through to helping me first hand with my goals. Katie is my personal trainer, my coach, my friend and my spiritual advisor. Our relationship is a little bit different to how she normally works with her clients but what can I say I'm special! Katie is a personal Trainer at Les Mills Auckland City. She is in the gym with clients Tuesday to Saturday, she writes programs for her girls and loves women’s health. It’s hard for me to explain Katie and my love for her, so I will let her do the talking. Katie, you are an awesome PT, how did you get into personal training and why do you love what you do? I got into personal training because in 2013 I started my journey to “ self like” if you want to call it that. I was painfully self-conscious and suffering from terrible anxiety and crippling depression. I was told exercise would help me, so I embarked on my journey, and after a year I couldn’t believe how much my life had changed I had learnt willpower, I found confidence in myself and my anxiety and depression was under control. It was then I decided I wanted to help other women with their journeys, to find strength when you feel you are at your weakest. To find acceptance and even love amongst the self-discomfort or dislike. I love being a PT; I am deeply passionate about helping other women feel the very best they can whether that be physically, mentally or emotionally. You love women’s health, tell us more about this? In my 25th year, I competed in a bodybuilding show, and my history of anxiety teemed with self-confidence issues lead me down the controlled anorexia rabbit hole. I managed to damage my hormones in the process, and it’s taken me almost three years to repair them. In the midst of my journey back I fell in love with the intricate matrix of our hormonal structure. Women's health plays a massive part in mental, physical and emotional health; therefore repair and care are essential for us. You always appear so driven so what drives you? I feel like through Personal Training and mentoring if I can make a difference to one persons’ life, and they help someone else and so on - maybe we can create a positive chain reaction in our world. As a PT what makes you different? I feel my difference is I care deeply; I don’t just care about my client for the hour they are with me, I’m forever thinking about how I can better a training programme or help in or outside the gym. I’ve also been through a lot on my journey so I can relate to most of the things most women are going through form negative self-talk - to body dysmorphia, to learning about healthy food choices. I like to use my lessons to help all my ladies get to their goals quicker!! As a PT I feel like you treat me in a unique way, which I love! How do you work with your clients in different ways to help them reach their goals? 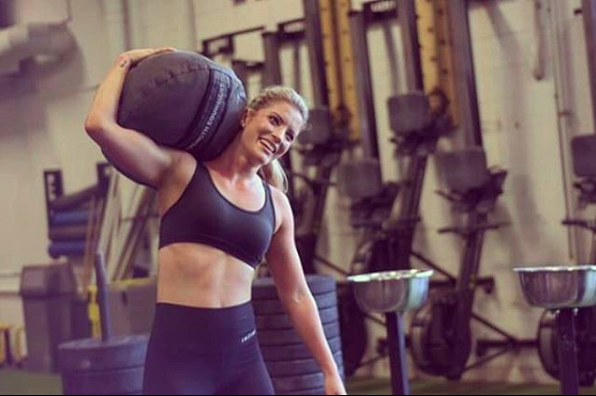 For you specifically Hannah, I consider what kind of training you love and what kind of body-specific goals you have, plus any mental challenges you may be bumping up against - and I take all of these into consideration when programming and checking up in our sessions. I know for example you want to improve your burpees and functional movements so I programme more of those in so you can progress. How do you train, what does your average week look like? Haha, in a nutshell, I train from Tuesday - Sunday with a mix of hypertrophy, functional training and a bit of CrossFit. I always also try to get in yoga for mindfulness and stretching. What is your most favourite exercise and why? Honestly, if I had to pick one, it would be a cross between a kettlebell swing or a burpee. Both get the heart rate going and done properly a kettlebell swing can be a full body workout. Katie is someone who has become super special to me, and although I don’t like sharing her, she is one of those rare humans everyone needs to know. If you are looking for a PT, by the way, I recommend Katie 100%; she totally will be there to help you reach your goals no matter what they are.